Engaging youth in government and other high level decision making is central to building youth power and thus an integral part of YWP programs. YWPs youth advocacy and civic engagement work represents such a long journey for our youth staff that starts with digging up and telling their stories, placing personal experience within institutional failure, recognizing the commonality of their co-workers also experiencing the same problems, and then imaging the possibility of change and translating that into concrete recommendations. Currently, YWP programs have 4 main civic engagement opportunities including oversight testimony for the DC Council, Youth-Adult Working Groups, policy development, and the Youth Vote Project. These project build youth skills and capacity to do power analysis and action around issues they identify and to be decision makers and problem solvers—through the policy process. 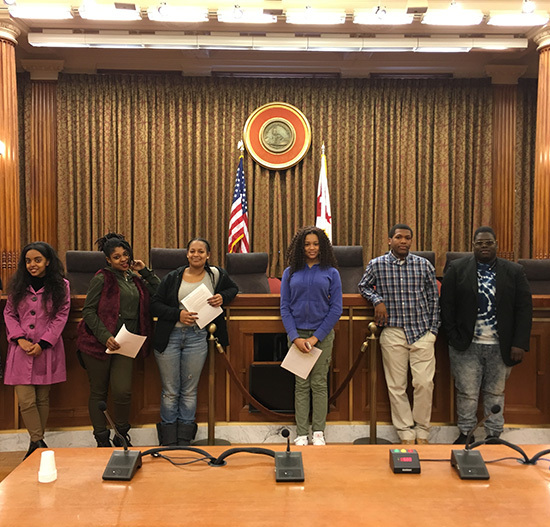 Currently, YWP programs have 4 main civic engagement opportunities including oversight testimony for the DC Council, Youth-Adult Working Groups, policy development, and the Youth Vote Project. These project build youth skills and capacity to do power analysis and action around issues they identify and to be decision makers and problem solvers—through the policy process. Oversight Testimony for the DC Council: Each year, the DC Council holds a series of oversight hearings on the performance of city agencies. The hearings, which feature testimony hundreds of witnesses, youth and adults, private citizens and nonprofit leaders. Each year, YWP prepares more than 50 teens and young adults who present testimony on all youth-serving agencies including Child and Family Services, Department of Employment, DC Public Schools (DCPS), Office of the State Superintendent of Education (OSSE), State Board of Education (SBOE), Department of Human Services (DHS), Department of Parks and Recreation (DPR), Department of Transportation, and other agencies. This oversight testimony is an opportunity to present information about youth needs and experiences and make recommendations about laws, policies, and funding that is needed to respond to youth needs. It helps to hold agencies accountable, allocate budget resources, move policies, and fund needed programs. Include link to testimony page. Youth-Adult Working Groups: These project-specific work teams bring youth and adult members together to develop specific programs or legislation. Youth-Adult Working Groups generally cover five areas: 1) Identifying youth needs and assets; 2) Identify priority program areas, youth benchmarks; 3) Develop and articulate youth-adult partnership model; 4) Conduct outreach, social marketing campaigns, etc. to bring youth in Agency programs; 5) Make recommendations for contractors and funding. YWP has assumed leadership for three youth working groups in the past three years including the Health Education Standards Working Group (facilitated with the State Board of Education), the Aftercare Youth Working Group (facilitated with the CFSA), and the Legislative Working Group to develop the Youth Rights and Responsibilities Act. We are currently working on the Youth Services Working Group (facilitated with the Youth Program Division of the DHS) and the Director’s Youth Advisory Board with the DPR. This past year, YWP worked on two projects that integrated youth voices directly into the policy development process. One was organizing and guiding the Youth Working Group for the DC Health Education Standards development process which conducted research, drafted standards, and identified priorities for the new 2016 DC Health Education Standards. The other was the Older Youth Aftercare Working Group, which developed benchmarks, program design recommendations, and operating guidelines for the new CFSA statement of work to be used by the new Aftercare contractor and to guide the older youth work inside the agency.